246 pages | 26 B/W Illus. 13. Reflecting on the Great War 1914-2019: How has it been defined, how has it been commemorated, how should it be remembered? David C. Harvey is an Associate Professor in Critical Heritage Studies at Aarhus Universitet, Denmark, and an Honorary Professor of Historical Cultural Geography at the University of Exeter (United Kingdom). His work has focussed on the geographies of heritage, and he has contributed to some key heritage debates, including processual understandings of heritage, extending the temporal depth of heritage, the outlining of heritage-landscape and heritage-climate change relations and the opening up of hidden memories through oral history. His recent works include The Future of Heritage as Climates Change: Loss, Adaptation and Creativity (edited with Jim Perry, 2015), Commemorative Spaces of the First World War: Historical Geography at the Centenary (edited with James Wallis, 2017), and ‘Critical heritage debates and the commemoration of the First World War: productive nostalgia and discourses of respectful reverence’, in Helaine Silverman et al (eds) Heritage in Action (2017). James Wallis is a research fellow at the Universities of Exeter and Brighton. Currently employed on ‘Reflections on the Centenary of the First World War: Learning and Legacies for the Future’, he has worked on several post-doctoral First World War-related projects – including affiliations with the ‘Everyday Lives in War’ Public Engagement Centre (University of Hertfordshire) and ‘Living Legacies 1914–18’ (Queens University Belfast). Formerly an Arts and Humanities Research Council-funded Collaborative Doctoral Award student at Exeter and Imperial War Museums, his research explores the critical geographies of conflict heritage in a variety of contexts. Recent and ongoing projects examine the relationship between photography and conflict commemoration, and museological interpretations of the First World War. 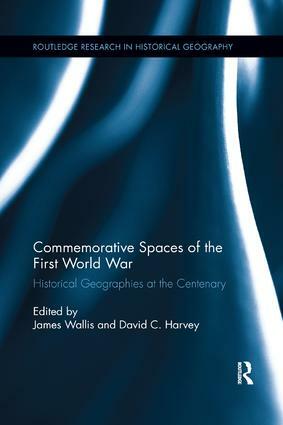 His recent work includes Commemorative Spaces of the First World War: Historical Geography at the Centenary (edited with David Harvey, 2017).